After breakfast guide pic you up from where you say Departure of our 4×4 to the South by the famous Tichka pass, visit the Kasbah of Telouet, descent of the valley of the Ounila Berber valley with sublime architecture. After visiting the Kasbah Ait Benhaddou, and after Tizi n’Tinifift we drive along the Draa Valley from the town of Agdez. The landscape offers beautiful palm groves punctuated by Ksours and Douars and a beautiful architecture of mud. Night in a hotel. After visiting the pottery workshops and the Koranic library of Tamegroute, you continue your journey towards M’hamid crossing the sandy wadis and varied vegetation of tamarisk and calotropis until Dayat Chegaga, place of usual gathering of nomadic families. Arrival at Erg Laabidlia and join his beautiful camp in the desert. 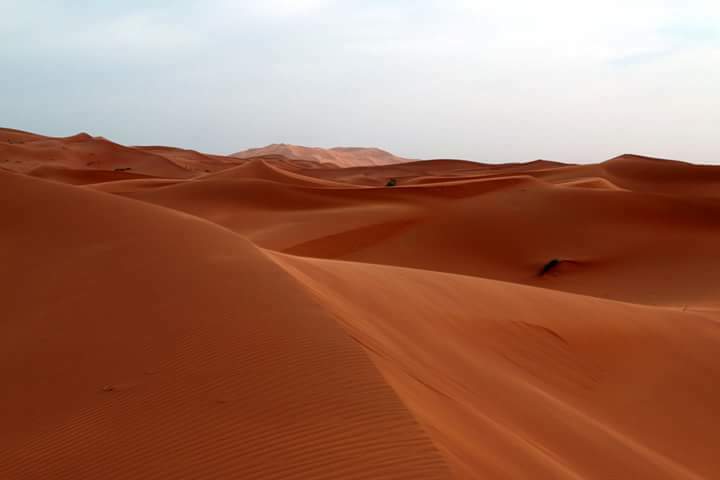 Possibility of a camel ride in the dunes … night under the stars in the Sahara. Early departure to the foothills of the Anti-Atlas. You cross the huge plateau LAKE IRIKI, and you will pass the small town of Foum Zguid, Taznakht and the capital of saffron and carpet wawzguit. You join Amerzegane to find the road to Tizi n’tichka and return to Marrakech at the end of the day.